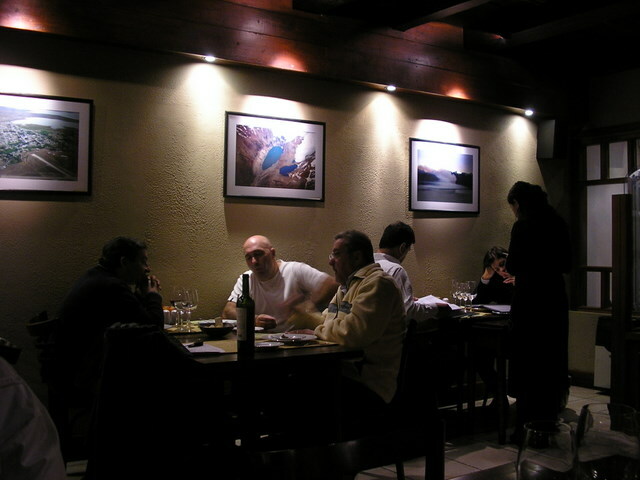 Most El Calafate restaurants are on, or just off, Avenida Libertador. 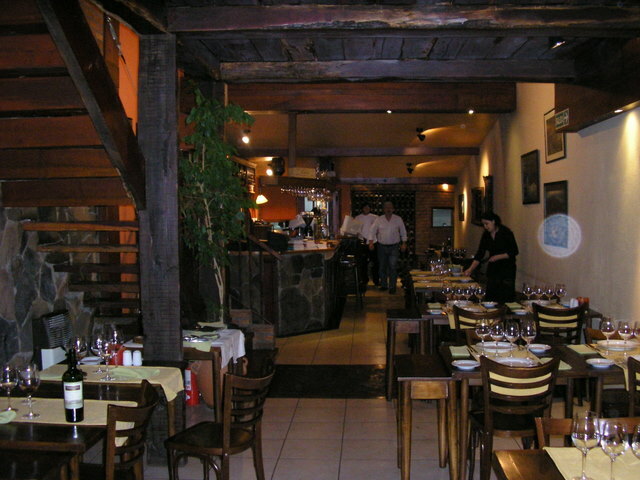 Nearly all serve the classic Argentine mix of grilled meats and pastas with a number of Pizza places, coffee and chocolate shops. Their prices also reflect the tourist town economy. Night life with bars and clubs are numerous but nearly all close after the summer season. Just looking at the menu of Restaurant Pascisco, seemed to promise somthing other than the ordinary. On my last night in El Calafate I dined there with two new friends from Columbia. In the clutter of El Calafate’s tourist shops you have to hunt for 25 de Mayo 52. I walked past it several times until, by a process of elimination, I noticed the unobtrusive sign in front of the simple and stylish glass and wood front. The interior is just as unobtrusive but even more stylish with indirect lighting on original artwork, dark wood tables, white linen and gleaming crystal. Pascisco seats 50 to 60 people with a small service bar at the end of the fairly narrow room. An open wood staircase went to a second floor room. The Argentine music being played was soft and relaxing. The menu was exciting for El Calafate. 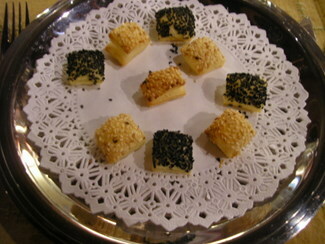 They had fish - trout, sea bass, and salmon - either grilled or with sauces, and a seafood casserole. Their beef and lamb indicated preperations and sauces different from the traditional parilla style. I was told they sometimes have nandu, a Patagonian cousin to the ostrich, but, unfortunately it was not available. They did have Liebre Cozadora (hare). 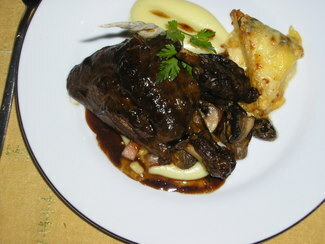 Hare is slightly larger than rabbit and Pascisco presented a braised half in a rich red wine reduction with wild mushrooms and diced smoked ham. It was pared with a small side of creamy potatoes and a wedge of au gratin potatoes that were a perfect foil for the deep earthy flavors of the hare and wild mushrooms. An Ensalada Valentine was an inspired mix of chopped cherry tomatoes, black olives, sweet pickles, small croutons, topped with arugula, a generous handful of toasted hazelnuts and strips of fresh parmesan along with local goat cheese all in a balsamic vinaigrette. 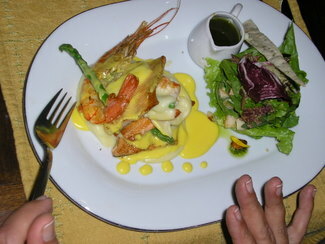 My Columbian dining partners chose trout but prepared in different ways. 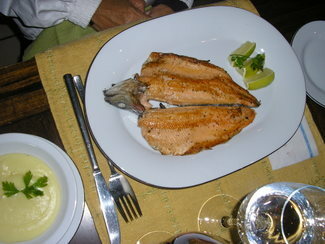 A fillet of grilled trout, simply seasoned, came pared with the creamy potatoes - these were not just “whipped” but a puree. Trout topped with a light cream sauce seasoned with basil and orange was topped with whole shrimp, with their heads. 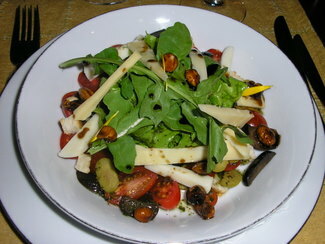 On the side was a small tower of baby greens, fresh corn and dry fruit. 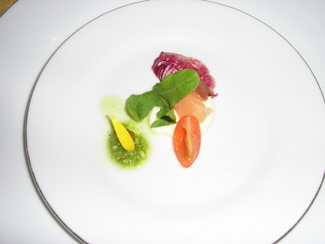 It was a beautiful presentation and an excellent combination of textures and flavors. I had been tempted to order the Sopa de Calabaza y Sanatoria (squash and pumpkin soup) which I saw other diners enjoying but felt I’d be overeating - I would have. 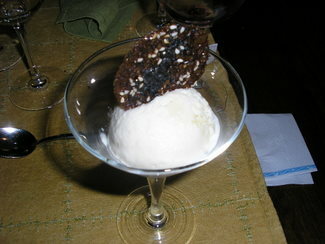 My dining partners did talk me into a dessert, which I usually never order, of Coffee Gelato, which had a nice flavor but some ice crystals were too large. The wine list was a superb representation of the best vineyards in Argentina and reflected in the price. They had a few in the AR$100 (US$28) range, but most were several times that amount. My dinner, with a glass of wine and tip, was on par with other premium Argentine restaurants and well justified given the imagination, quality and presentation: AR$200 (US$53). Before dinner, Pascisco presented two amuse bouche that were tasty and fun - tiny light seeded biscuits and a mini smoked salmon salad.